Day 41, BUS 1: Constanta, forget tourism, let’s talk minimum income! The second stop of the EMIN BUS in Romania was in the city of Constanta, located on the Black Sea coast. Mainly known as a tourist destination and harbour, Constanta has often made the headlines for its contested development measures in recent years. Discussions typically revolve around developing touristic facilities and infrastructure but rarely about the impact that tourism-centred development has on the local population, or its broader needs. Against this context, the EMIN event in Constanta was well attended – despite it being held on a Saturday. Speakers who followed the EMIN BUS from Giurgiu – representatives of trade Unions, Friedrich Ebert Stiftung, Roma activists and academics – engaged with local RENASIS members, representatives of Social Work Departments within local municipalities, representatives of local NGOs and academics from the local University and media. 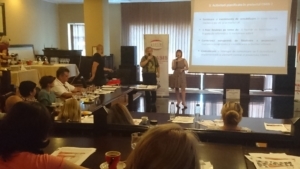 Presentations addressed the status quo of minimum income schemes in Romania, in work poverty, child poverty and the ways in which local and national politicians together with the media often provide negative portrayals of people in need of minimum income. Participants also debated who the minimum income is designed for. Participants found shocking the results of a recent study by World Vision on “Children’s Welfare in Rural Areas”, despite the fact that most of them are engaged in fighting poverty and social exclusion. 1 out of 11 children in Romania goes to bed hungry, 6% of children only sometimes have enough food to eat and 3% never have enough food; 1 out of 5 children is tired at school because they work in the household, while 1 out of 5 families cannot afford to go to the doctor when their children are ill. These results constitute another proof of the urgency to have adequate, accessible and enabling minimum income schemes in Romania. Since Romania last updated minimum income schemes in 2001, it is important to immediately adjust the value of minimum income to the current living expenses. In broader terms, we should approach minimum income schemes in a more strategic way, as part of a social services and benefits package and not as a self-standing measure. 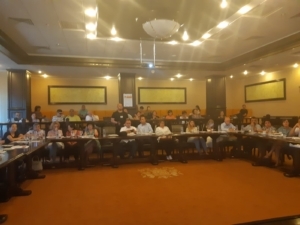 Researchers from the local University presented the disparities between rural communities of the county of Constanta that experience severe forms of poverty and the more urbanized areas and sea resorts that are the typical recipients of local budget resources. They used the evidence produced by their research to plead for ensuring the access to adequate minimum income schemes for the members of the communities who participated in their inquiry. Another presentation aimed to deconstruct myths circulated in the media about people experiencing poverty and the social benefits they access. It showed how national politicians are participating in the construction of these negative narratives and use people in need of social services and benefits as scape goats to justify budget deficits. They are often at the origin of negative discourses professed by the media about people experiencing poverty. The negative portrayal of poverty and its causes and the biased accounts of abuses of social benefits and services by people in need create a rather unfavourable social and political climate for the now long time postponed law on minimum income. The day concluded with a debate around the role of minimum income schemes in society and who should they be designed for. The conclusion was that minimum income schemes should not be conceived as solution for a social plight but as safety net that most of us might be in need of at some point in our lives, irrespective of our socio-economic status or level of education. The happening around the bus was held in the most central square of the city – the Ovidius Square – and it blended in with the weekend activities of the city life – weddings, tourists passing by and locals taking a stroll in the city centre as the square was located nearby the beautiful promenade. 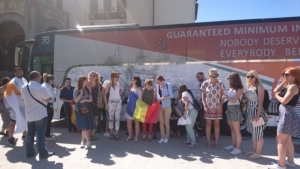 The bus was also visited by an enthusiastic group of students from different countries – Greece, Croatia, Malta, Cyprus, etc who were in Constanta with an ERASMUS exchange programme. 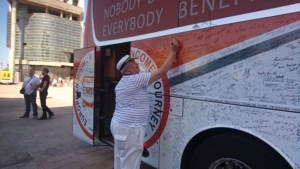 They were happy to know that the BUS and with it debates about minimum incomes have travelled their countries as well.